Baby - 100th Day "Baek-Il"
Korean Baby's 100th Day Celebration - "Baek-Il"
If you were planning a Korean Culture themed Korean party for kids, we love this idea we found from CatchMyParty.com posted by Jack's mom for his 100th birth day celebration otherwise known as the Korean 100th Day Feast "백일 잔치" or "Baek-il Janchi". The personalized designs, Korean kids books like "Bee-bim Bop!" and "I Love Korea!" along side a room full of traditional handmade paper Korean fan's and a touch of Blue Gingham makes me want to throw a Korean themed party for my kids one day. What a clever party! We hope you can enjoy more photos from this party by clicking here: Jack's Korean 100th Day Celebration. 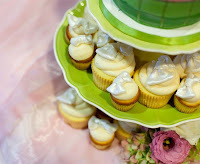 Take a look at a few 100 Day Celebration Cupcake & Cake Designs as inspiration. Cameron turned 100 days last week and just look at how his family and friends celebrated his huge stepping stone. We are so happy to be able to share in the Cameron's 100th Day celebrations here thanks to the photos - courtesy of Cre8ive Chris. She has been putting her awesome talents to the test, and her results are awesome. Can you find a White Tiger Balloon art on the table? So if you're looking for a party coordinator who is balloon artist and entertainer at the same time, choose Cre8ive Chris! The Park family celebrated daughter Sera's 100 days with an intimate family dinner in Irvine. 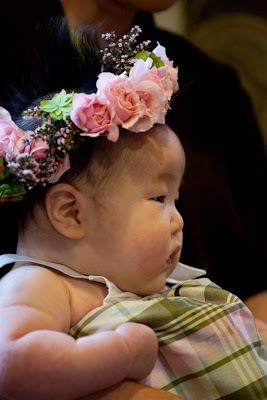 Long ago Korean past, many babies did not make it past a 100 days due to poor healthcare and living conditions. So for those that reached 100 days, it was a reason to celebrate! Today, the milestone continues to be significant, gathering family and friends together to officially welcome the new joy in their lives! 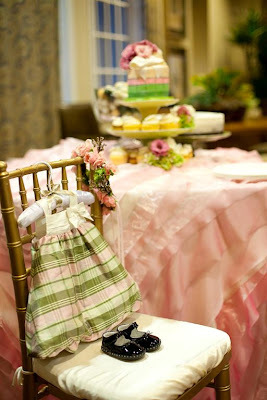 Sera's 100 day celebration decor was inspired by her adorable tourmaline plaid bubble dress. 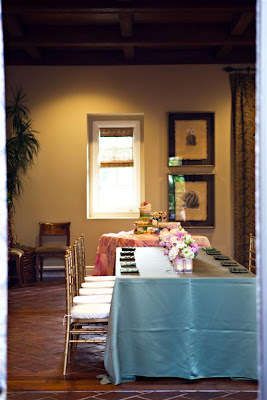 While a simple family gathering, the dining table and cake table with traditional rice cakes were dressed in rich colors of sage, moss, creme, and dusty pinks. The dinner was elegant without being overwhelmingly "adult", highlighting the little guest of honor! In Korea, on the 100th day after a child's birth, a small feast is prepared to celebrate the child's having survived this difficult period. If the child is sick at this time, the family passes the day with neither announcement nor party, for to do otherwise is considered bad luck for the infant. At this time the samshin halmoni is honored with offerings of rice and soup in gratitude for having cared for the infant and the mother, and for having helped them live through a difficult period. The family, relatives and friends then celebrate with rice cakes, wine, and other delicacies such as red and black bean cakes sweetened with sugar or honey. To prevent potential harm to the child and to bring him or her good luck and happiness, red bean cakes are customarily placed at the four compass points within the house. If the steamed rice cakes are shared with 100 people, it is believed that the child will have a long life. 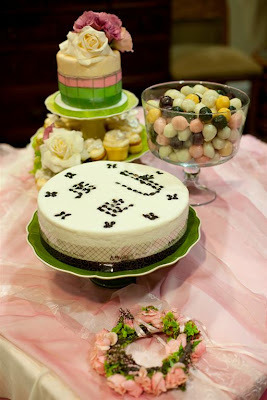 Therefore, rice cakes are usually sent to as many people as possible to help celebrate the happiness of the occasion. Those who receive rice cakes return the vessels with skeins of thread, expressing the hope of longevity, and rice and money, symbolizing future wealth. 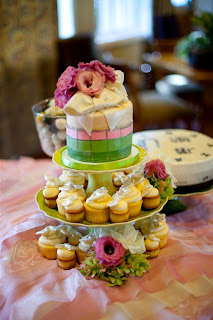 Such customs are also part of the tol, or first birthday, celebration. Because of the high infant mortality rates in the past, this celebration is considered to be even more important. Like the 100th day celebration, it begins with offerings of rice and soup to the samshin halmoni. However, the highlight of this celebration is when the child symbolically foretells his or her own future. For this ritual, the child is dressed in new traditional Korean clothes. A male child wears the traditional hood worn by unmarried youths, and the female wears make-up. The child is seated before a table of various foods and objects such as thread, books, notebooks, brushes, ink and money which have all been given to the family by friends and relatives. The child is urged to pick up an object from the table, as it is believed the one selected first will foretell the child's future. If the child picks up a writing brush or book, for example, he is destined to be a scholar. If he picks up money or rice, he will be wealthy; cakes or other food, a government official; a sword or bow, a military commander. If the child picks up the thread, it is believed he will live a long life. This is followed by feasting, singing and playing with the toddler. Most often guests will present gifts of money, clothes, or gold rings to the parents for the child at this time. Upon departure, guests are given packages of rice cakes and other foods to take with them. This sharing of rice cakes is thought to bring the child long life and happiness. The hwan-gap, or 60th birthday, has also been considered an especially important birthday celebration, for this is the day when one has completed the zodiacal cycle. Even more important is the fact that, in the past, before the advent of modern medicine, few people lived to be 60 years old. hwan-gap was therefore a time of great celebration when children honor their parents with a large feast and much merrymaking. With the parents seated at the main banquet table, sons and daughters, in order of age, bow and offer wine to their parents. After the direct descendants have performed this ritual, the father's younger brothers and their sons and then younger friends pay their respects in the same manner. While these rituals are being carried out, traditional music is usually played and professional entertainers sing songs, urging people to drink. Family members and relatives indulge in various activities to make the parents feel young, often dressing like small children and dancing and singing songs. 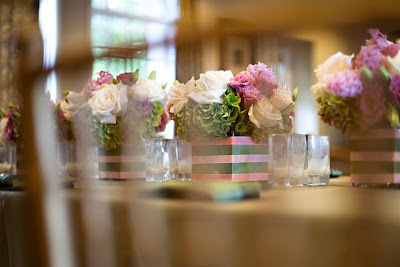 In the old days, guests would compete in composing poetry or songs in celebration of the occasion. 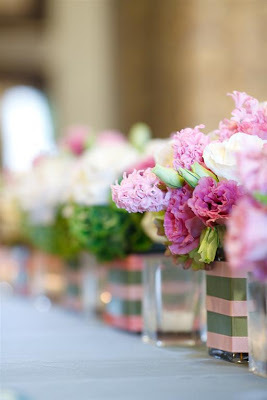 In the past, years after the 60th birthday were regarded as extra years and although subsequent birthdays called for a celebration, it was not celebrated as lavishly as the hwan-gap party. Upon the 70th birthday, or kohCui meaning old and rare, another celebration equal in scale with the hwan-gap was celebrated. Although smaller in size and scope than the hwan-gap and the tol celebrations, the birthday celebration of each member of the family calls for ample food, wine and specially prepared delicacies.